Art is a must-have for any thriving community. And that’s why we are proud to announce today that we have been selected as a recipient of a Hewlett 50 Arts Commission. 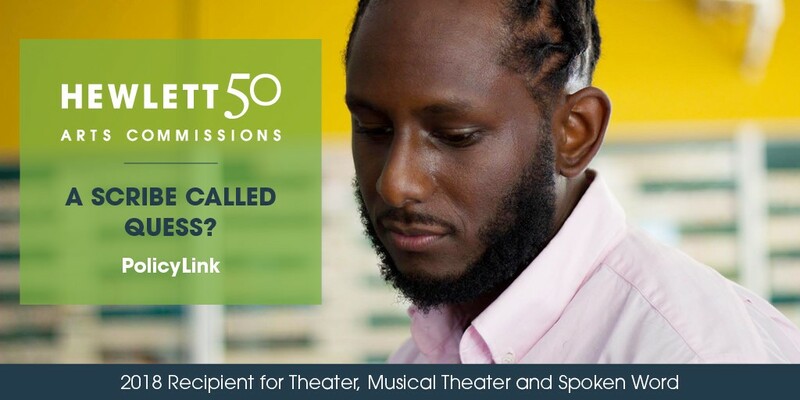 Launched in 2017 to celebrate the foundation’s 50th anniversary, this is a five-year, $8 million initiative supporting the creation and premiere of 50 new works by world-class performing artists working in five disciplines. PolicyLink is among a group of 10 Bay Area-based non-profit organizations that will receive $150,000 each to create important and unique work that facilitates discussions around the most pressing local issues. One source of inspiration for the development of the performance will be data from the National Equity Atlas (the PolicyLink partnership with the Program for Environmental and Regional Equity at the University of Southern California). Another important source will be direct engagement with people in communities across the country affected by economic insecurity. Lead artist Michael “Quess?” Moore and PolicyLink Senior Fellow and creative director of “We, the 100 Million” Jeremy Liu will work closely with our staff of researchers and public policy experts and local communities to communicate a richer and more nuanced understanding of the lived experience of 100 million Americans struggling to make ends meet. To learn more about the Hewlett 50 Arts Commission and the nine other awardees, click here.